It never hurts to have a few ideas at the back of your head when you start planning a 4th of July menu, or just in case you need a dish to bring to the barbecue of friends or family. The easiest thing you can do is make up a big bowl of fresh blueberries, strawberries and raspberries and bring it out along with some whipped cream or ice cream for a red, white and blue dessert. Here are a few more suggestions that are just as festive and don’t take too long to throw together, either. One of the easiest and most fun desserts for the 4th are Red, White and Blue Chocolate Dipped Strawberries. These are simply strawberries dipped in white chocolate, then dipped in blue sprinkles for the final splash of color. Have the kids help make these, and let them have some fun dipping other things, as well. Another great option is cake. 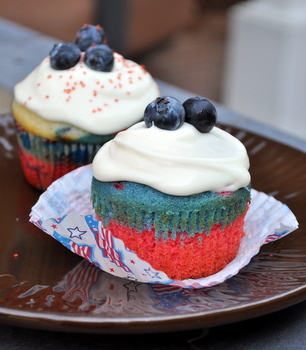 Red, White and Blue Forth of July Cupcakes are perfect if you’re looking for single-serving desserts. 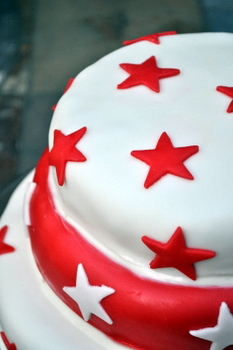 Otherwise, a Red, White and Blue Velvet Cake can be a real showstopper before the fireworks start. Red, White and Blue Berry Yogurt Cake is a colorful cake that doesn’t use any food coloring for its bright red and blue colors, but instead from loads of fresh blueberries and raspberries that are folded into the cake batter. Fresh Strawberry Pie and Fresh Blueberry Tarts are even more good dessert ideas, in keeping with the red, blue and berry themes of the holiday. Of course, just about any pie or cookie recipe is sure to be a hit, so keep in mind where your dessert is going to be served before you decide what to make. Going to a picnic? Opt for the cupcakes, which travel easily. Entertaining at home? Either the pie or the tart would be a good option, kept in the fridge until ready to serve. Barbecuing? Skip the baked goods in favor of campfire s’mores. And if you’re going to be somewhere with microwave access, definitely do the white chocolate dipped strawberries at the party – they’re cute when you bring them out, but they’re a dessert that people love to play with! Hey, them strawberry you got up they sure look good. I need to try them. I think you have a great art for baking and for your cooking. Keep it up. Now, I haven’t seen everything on your page. But the look at them flag stripped strawberries, I say do are doing a great job.